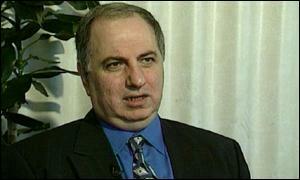 Ahmed Chalabi was, before the fall of Saddam Hussein, one of the best known Iraqi opposition figures in the West. He has fallen from grace dramatically since, and now faces a warrant for his arrest in Iraq. Ahmed Chalabi led the foremost Iraqi opposition movement, the US-backed Iraqi National Congress [INC]. The 57-year-old former businessman was even been tipped by some analysts, and some leading officials in Washington, as a possible successor to Saddam Hussein. A Shia Muslim born in 1945 to a wealthy banking family, Mr Chalabi left Iraq in 1956 and has lived mainly in the USA and London ever since, except for a period in the mid-1990's when he tried to organise an uprising in the Kurdish-controlled northern Iraq. The venture ended in failure with hundreds of deaths. Soon after, the INC was routed from northern Iraq after Saddam's troops overran its base in Irbil. A number of party officials were executed and others - including Mr Chalabi - fled the country. A seasoned lobbyist in London and Washington, who studied mathematics at Chicago University and the Massachusetts Institute of Technology, Mr Chalabi is often described as a controversial figure, charismatic and determined but crafty and cunning at the same time. Mr Chalabi has been accused by some opposition figures of using the INC to try to further his own ambitions. There are also allegations of financial misdemeanours. In 1992, he was sentenced in absentia by a Jordanian court to 22 years in prison with hard labour for bank fraud after the 1990 collapse of Petra Bank, which he had founded in 1977. Although he has always maintained the case was a plot to frame him by Baghdad, the issue was revisited later when the State Department raised questions about the INC's accounting practices. In interviews after the fall of Saddam Hussein, Mr Chalabi discounted the possibility he would take a role in any future government. "Personally, I will not run for any office, and I am not seeking any positions. My job will end with the liberation of Iraq from Saddam's rule," he is quoted as telling the German weekly Die Zeit. He had strong backing among some sectors of the US Congress and the Pentagon, but had little grassroots support in Iraq and a number of opposition groups sought to distance themselves from the INC. In 1998, the then US president, Bill Clinton, approved a plan to spend almost $100m to help the Iraqi opposition - principally the INC - to topple Saddam. But only a fraction of the money was ever spent, and the INC subsequently suffered leadership infighting. In May 2004, Mr Chalabi's home and offices were raided. He denounced the raid, which he said was carried out by American agents and Iraqi police, as politically motivated. There were whispers from Washington that Mr Chalabi had all along been duping the Americans by spying for the Iranians. It appeared that he was being sidelined by Washington because he and his organisation were one of the sources for intelligence about Iraq's weapons of destruction capability that is now widely viewed as faulty. In August 2004, Mr Chalabi and his nephew Salem Chalabi has arrest warrants issued against them while they were outside Iraq. The charges against Ahmed Chalabi relate to alleged counterfeiting activities. He denies the charges.